SUGAR COOKIESSSS!!! I am a girl obsessed. I’ve baked my Healthy Sugar Cookies THREE times in the last two weeks. Every single batch gets gobbled up as if we are getting paid to shove them in our pie holes. I was dying to use my DIY Rainbow Confetti in yet another recipe, and since I was about to make another batch of sugar cookies… BAM! Lightbulb flashed on. 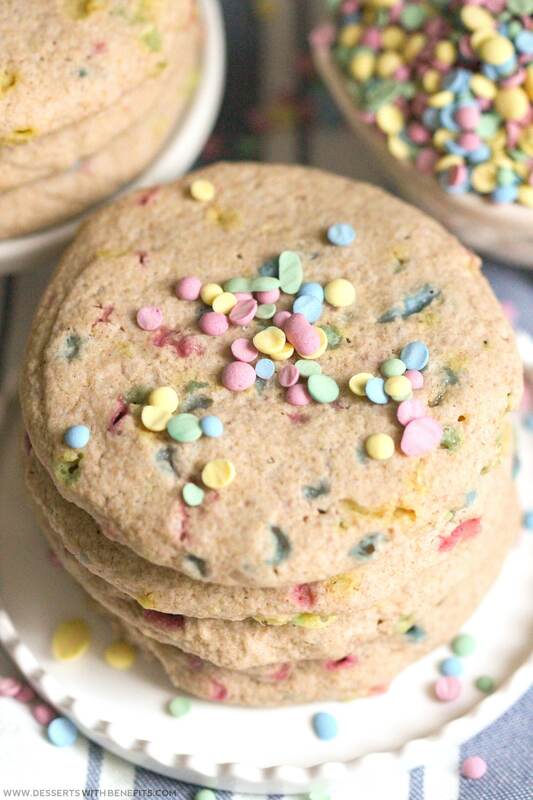 Healthy Funfetti Sugar Cookies! These cookies literally made my mouth drop, they are THAT good. I picked up a cookie off the cooling rack and took my first bite. 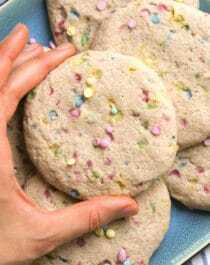 It was soft and chewy, and I got the instant sweetness and buttery notes that every sugar cookie needs. Slowly but surely, the classic almond extract flavor rolled in. I took my cookie with me and had to walk out of the kitchen. I knew for a fact that if I stayed standing by the entire batch of cookies, there would no longer be an entire batch of cookies. Well, I guess there would be, but they’d all find a new home in mah belly. Don’t ya just wanna grab one? It was hard to photograph these cookies — not because I was hungry and drooling like an animal, but I think that did play a part — but because the sprinkles look like they created air pockets inside the cookie. Maybe it’s just me, but the photos make the cookies look dry. But they’re not! Your teeth sink through and the center is super chewy. I apologize for my lacking photography skills. But trust me. These cookies are BOMB. 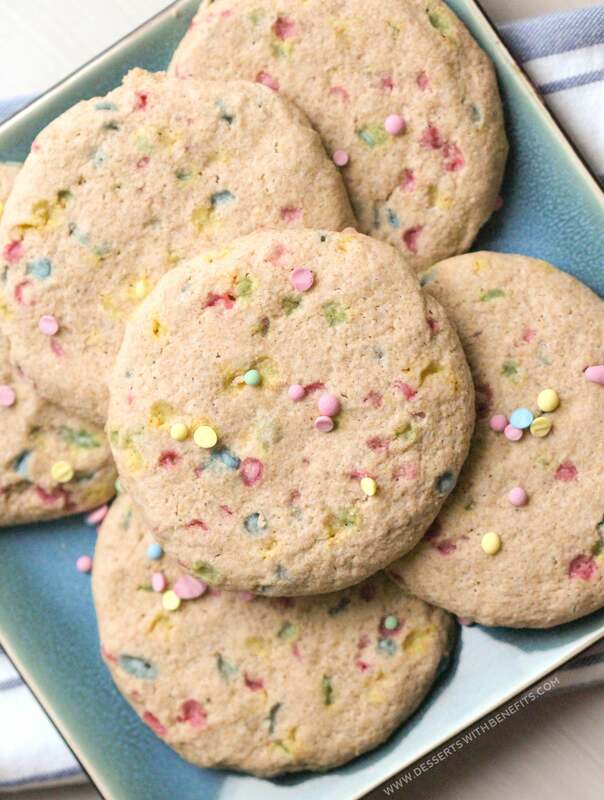 These Funfetti Sugar Cookies are soft and chewy. You get the sweetness and buttery notes that every sugar cookie needs, and then the classic almond extract flavor rolls in. Preheat your oven to 350 degrees Fahrenheit and line a cookie sheet with parchment paper. 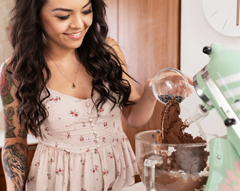 In a stand mixer bowl with beater attachment, add the coconut oil, almond milk, vanilla extract, butter flavor, stevia extract, and almond extract. Mix on medium-low speed. Scrape down the sides of the bowl and mix one more time to make sure the dough is even. Gently fold in the rainbow confetti. Scoop the dough into 10 evenly shaped balls and press them into circle "patties." Bake for ~10 minutes. Carefully slide the cookies on the parchment paper onto a wire cooling rack to cool completely. Serve! To store, keep these cookies in a tightly sealed container at room temperature for up to 3 days. These cookies are made with natural ingredients you can feel good about eating, and they’ve got a spectacular nutrition label as well. 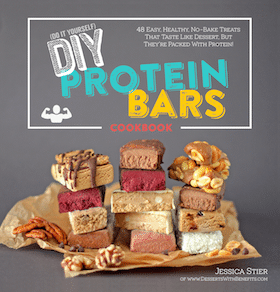 With complex carbohydrates, a bit of fiber, and some healthy fats, these cookies will fill you up, keep you satisfied, and curb those sugar cravings. 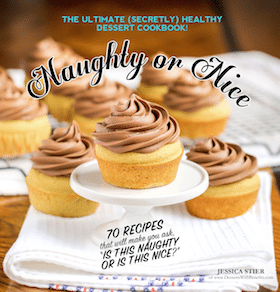 These are a much better option than the storebought cookie mixes filled with refined white sugar, white flour, hydrogenated oils, and artificial food dyes! 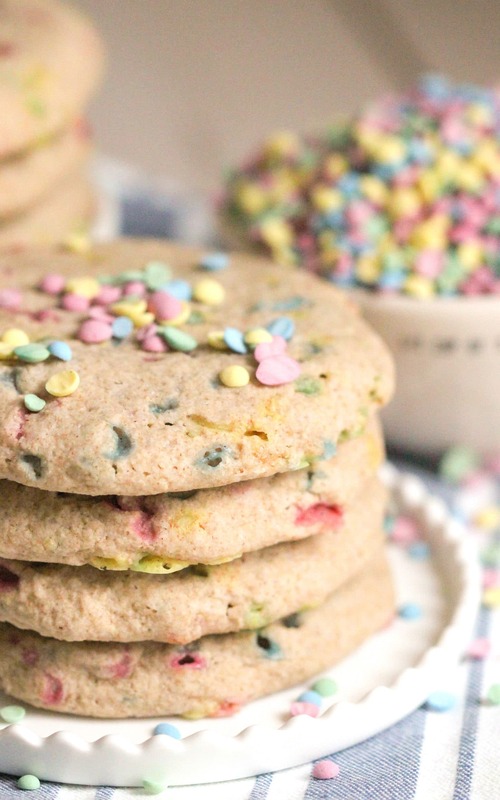 These Healthy Funfetti Sugar Cookies are awesome… yeah, that’s all I’ve got right now. I’d love to talk more about their soft and chewy and sweet and toootally addicting deliciousness, but I’m enjoying a cookie as we speak and I’m in a state of bliss. I know for a fact that I’ll be baking off my fourth batch of these cookies by the end of next week. 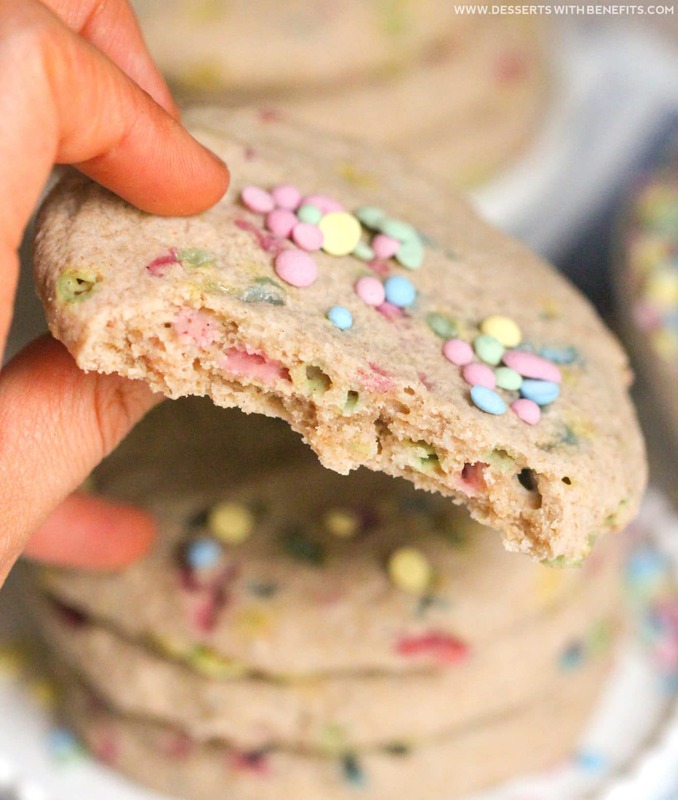 I love that you are finding delicious ways to use up those sprinkles! These cookies look delicious. I am a big fan of sugar cookies, especially ones that look soft and chewy like these! Why are you so amazing? And I mean this seriously… Your recipes are bomb!!! they sound good and look cute! Thank you! These look so yummy! Can you roll the dough out if you wanted to cut shapes out of it with cookie cutters? This particular cookie dough is like a moist cookie dough, so it won’t roll out that well. Sorry!